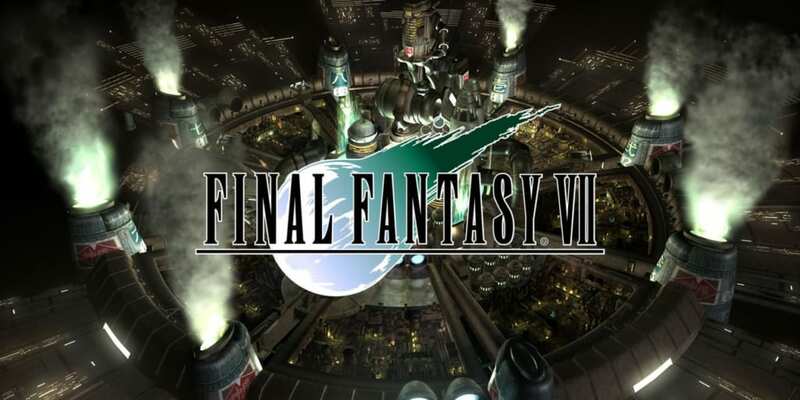 A complete walkthrough for Northern Crater in Final Fantasy 7 (FFVII,) including enemies encountered, obtainable items, and boss strategy guides. Save Crystal Northern Crater, ledge in the second area after climbing down from the Highwind. Power Source Northern Crater, ledge in the third area. HP Absorb Northern Crater, ledge in the third area, behind the wall opposite the Power Source. Elixir Northern Crater, ledge in the third area. Guard Source Northern Crater, ledge in the third area. Mind Source Northern Crater, ledge in the third area. Magic Source Northern Crater, ledge in the third area. Mind Source Northern Crater, ledge in the fourth area, lower right corner from the third area. Megalixir Northern Crater, cave in the fourth area, lower right corner from the third area. Hero Drink Northern Crater, ledge in the fourth area, lower right corner from the third area. Guard Source Northern Crater, cave in the fourth area, lower right corner from the third area. Power Source Northern Crater, cave in the fourth area, lower right corner from the third area. Climb the ledges to reach the cave. Enter and explore the cave. 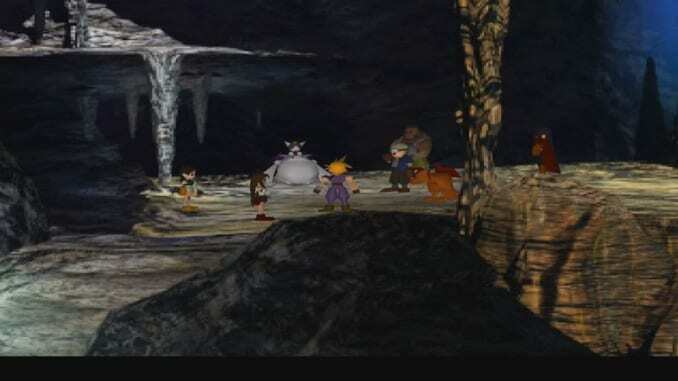 Collect the items along the forked paths inside the cave. Proceed to the last area to battle the final boss. Climb down the ladder and descend the slope to go to the path below. In the next area, jump down the ledge and take the Save Crystal on the left. Run down the spiraling path and get the Guard Source at the bottom. Continue down the spiraling path to head to the next area. 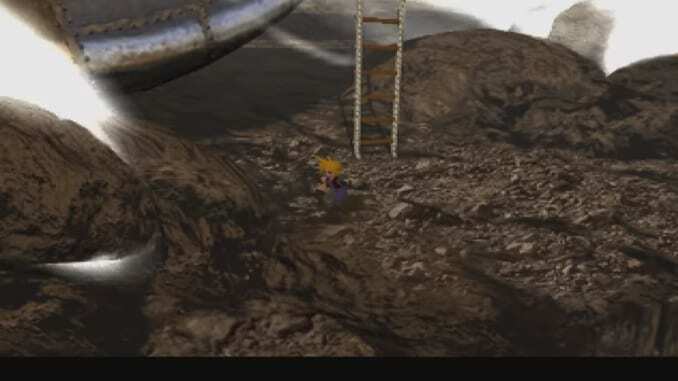 Jump down the ledge and climb up the one on the left to get a Power Source. Turn around and get the HP Absorb materia hidden behind the wall. Walk down to the next box to get an Elixir. Climb back up the top ledge and proceed to the right. Continue jumping down the ledges to pick up a Guard Source and Mind Source. When you get to the bottom, start moving left and move up. Pick up a Magic Source on the ledge to the right. Before continuing upward, head back to the right and head to the area on the lower right corner. In the next area, jump down and go right. Jump down again and get a Mind Source from the box. Move to the right again and climb back up the second ledge. 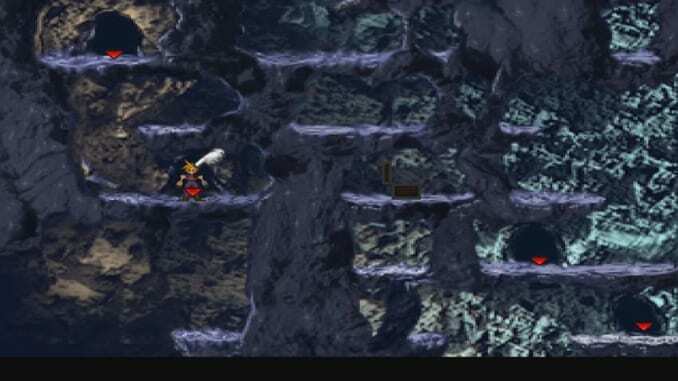 Move left and jump down to enter the cave on the lower left to get a Megalixir. Exit the cave and jump all the way down to the ledge on the left. Before entering the cave, get a Hero Drink in the box on the right. Enter the cave and get a Guard Source. Climb up the path and enter the hole to go up the ledge. Get the nearby Power Source. Go down and exit at the upper left to take you back to the upper ledge again. Move to the right and drop down twice before entering the cave below the ledge with the open box. Back in the cave, move to the path that goes right then turns to the left to exit the cave. Drop down to the left, then right. Finally, drop down to the left again and drop down again to the next area. A short cutscene will play when you arrive. Your party will split up to try and take all the paths branching from the fork. You can send members of your party down the different paths from here. This part only serves to let you collect as many useful items as possible before the final battle. Below is a list of the items you can obtain and which direction to send each of your party members. At the end of whichever path you chose, you will drop down to the bottom of the Northern Crater. Here you can collect the items that your party members obtained. Before proceeding further from here, you might want to make sure that you have completed all other sidequests and optional objectives. The next area automatically starts the final boss battle. Backtrack back to the Highwind and save your game there.